The Mars-bound spacecraft Terra Nova begins the long trek to the red planet in Discovery Channel's Race to Mars. The firstastronauts to explore Mars will undoubtedly face challenges, some of which maymirror those depicted in a new mini-series and documentary chronicling humanity?sinitial steps on the red planet. ?Raceto Mars,? a martian multimedia event orchestrated by the Discovery Channel Canada, follows the efforts of six spaceflyers on a 600-day mission to reach the red planet and huntfor life before China?s unmanned probes. The first installment of the four-hourminiseries airs tonight for viewers in Canada. ?This willbe the definitive story of the human mission to Mars,? said Paul Lewis, presidentand general manager for Discovery Channel Canada, in a statement. A six-partdocumentary ?Mars Rising? ? 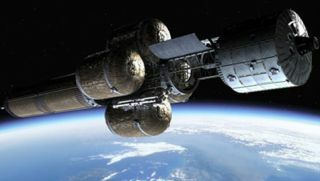 narrated by veteran space actor William Shatner ?will follow the mini-series beginning Oct. 7 to present an in-depth look at theinherent hurdles facing a human expedition to Mars. A companion book and multimediaWeb site further explore issues raised in the $20 million television events. ?With thisunprecedented multi-platform event, our mission is to reignite excitement inthe Space Age and inspire a whole new generation to look outward towards theplanets,? Lewis said. ? ?Race to Mars?arrives just before the 50th anniversary of the Space Age ? which beganwith the Oct. 4, 1957 launch of the former Soviet Union?s Sputnik1 satellite ? as NASA continues work to return humans to the moon by 2020. The U.S. space agency is drawing up plans for new spacecraft, largerhabitats and long range pressurized rovers as part of its lunar explorationvision. The flightexperience and hardware tests gathered from long-duration lunar sorties couldprove invaluable for a future manned flight to Mars, where a multitude of orbiterscurrently study the red planet from on high and NASA?s twin robots Spirit andOpportunity rove across its surface. But in ?Raceto Mars,? set in 2030, those early lunar and martian missions have long sincepast with China taking the lead in red planet exploration. Playing catch-up is aninternational manned Mars mission by Canada, the U.S., Russia, France and Japan. It?s anambitious mission with a massive crew transport craft (the Terra Nova) thatspins to produce artificial gravity, as robotic flights deliver the requisite astronauthabitat, rovers and other cargo. Commanding the flight is veteran astronautRick Erwin (Michael Riley, ?Supervolcano,? ?This is Wonderland? ), who overseesa four-man, two-woman crew of seasoned astronauts, engineers and scientists. ?Race to Mars?spends much of its focus on the psychological and engineering hurdles of longduration spaceflight, with the crew of Terra Nova wrestling against faultyhardware as well as their own interpersonal tensions. Crewrelations, it turns out, is no small feat. A joint team or Russian and Europeanresearchers here are Earth are planning a 520-day mock Mars missionto study the long-duration stresses that may afflict an astronaut crew en routeto the red planet. But asidefrom the hunt for water, and its implications for extraterrestrial life, Racefor Mars shows little of the other possible science astronauts may perform onthe red planet or what they might do with those precious moments of free time. ?? The ?Raceto Mars? companion book, by author Dana Berry, does provide more detail intothe Terra Nova astronauts? activities and peppers their story with relevant eventsfrom the last 50 years of spaceflight. To preparefor his role as the Terra Nova?s commander, Riley said he studied theexperiences of former NASA astronaut Jerry Linenger, who weathered a fire,system failures and a near-collision with an unmanned freighter while servingaboard Russia?s Mir Space Station. The firstmanned flight to Mars will also likely command attention the globe over likeNASA?s historic Apollo 11 mission that first set astronauts on the moon, addedRiley, who remembers exactly where he was during that first lunar landing. ?I wasseven years old and glued to my grandmother?s black and white television,? Rileysaid in a statement. ?My daughter is 11 and I hope she experiences the same kindof wonder when we land on Mars.? ?Race toMars? debuts tonight at 8:00 p.m. ET/9:00 p.m. PT (check local listings) on Discovery Channel Canada. Click here for more on the Race to Marsproject.